Hello and Happy New Year! I'm starting off 2018 with the fun "task" of being a Guest Designer for my friends at the Crafty Carrot Collective. These four lovely ladies were on the Stampin' Up Artisan Design Team with me, and I also had the chance to meet all of them in person in Canada last November. Left to right, there is Cindy from the US, Krista from Canada, Jen from Australia and Susan from New Zealand. I'm so excited to be guest designing with my talented friends this month! And here I am! I just figured out that I have been a Stampin' Up Demo since 2002! I'm also a two-time Artisan Design Team member. I really have made so many wonderful friends through this hobby of mine. Here is one of my projects for this month's program. The Party Pandas Stamp Set is a set you can earn for free when you purchase their February Crafty Carrot program. Aren't these pandas so cute? WHAT IS THE CRAFTY CARROT CO.? We're a group of four past Stampin' Up! Artisan award winners. Every month we bring an interactive online program for stampers all over the globe. The whole idea is to help you decide which products to buy and equip you to get the most out of them. We'd love you to be an active part of our wonderful crafting community! WHAT DO OUR ONLINE PROGRAMS LOOK LIKE? Each month we have at least four online classes within a private Facebook group. These classes are live, interactive and specific so you can craft along right beside us. Projects range from beginner level to advanced and are based around four different themes so you can really get the most out of your stamps. By the way - we know you'll get a lot out of the program even if you don't have the focus products AND you can still join by email even if you're not on Facebook (classes not live in this instance)! Our customers receive FREE access - our little (big) gift to you! Just place a Stampin' up! 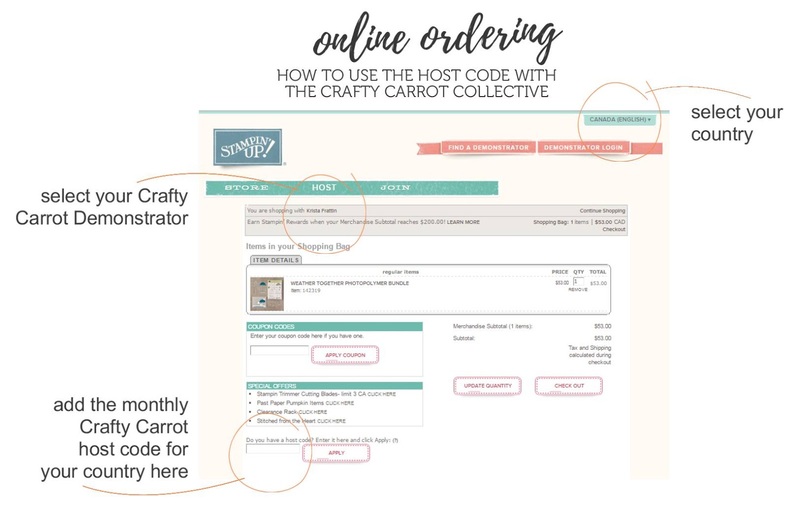 order greater than US$15 with your local Crafty Carrot Demonstrator anytime in the month to get free access to the next full calendar month's online classes. You can subscribe for one, three, or six months (making more savings the longer you go). Click on your choice below to be directed to Paypal and we'll be in touch within 24hrs! You can also pay directly to your Crafty Carrot demonstrator if you wish. Please note in whichever month you sign up, your subscription will start on the 1st of the following month. Please watch your inbox for an invitation to the Facebook group or let us know if you're not on Facebook. Our Stampin' Up! team members get FREE access to our programs, for their own enjoyment (especially the hobby demos) but also as an aid in their business planning processes. These gals are pretty special - email your country's Crafty Carrot demonstrator for more information on joining Stampin' Up! by clicking below. And, now move on to my friend Susan. I know you will love her project as much as I do!